When it’s hot outside, I like to dress cool with lightweight fabrics, loose-fitting styles, and cool colors. 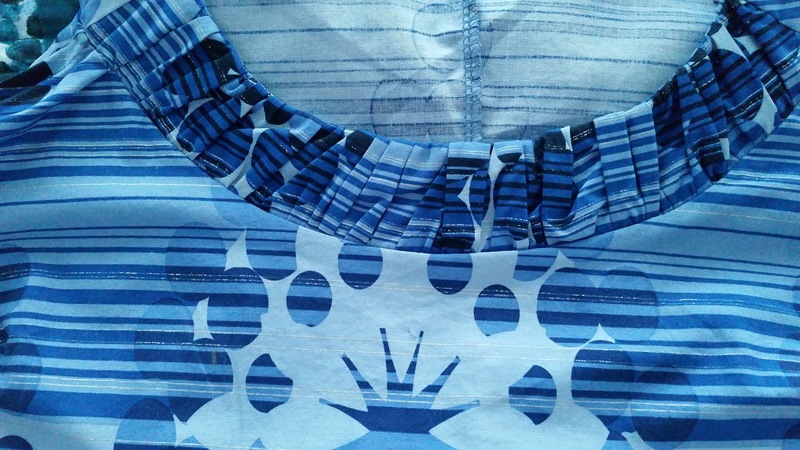 For me, blue and white are the ultimate cooling combination! When Fabric Mart had their last Maggy London fabric sale, I picked out 3 pieces with blue in them, not really knowing what I was going to make. I hate to admit it, but picking out the patterns for these fabrics took me far longer than actually sewing them! I have so many patterns that it can be overwhelming to try to narrow it down to the perfect one. I ended up using some patterns that I’ve had in the stash for a while, so they aren’t still in the stores, but perhaps you might have them in your stash too! The first fabric was a stretch poplin with a large print. I chose Butterick 5637, a tiered sundress, to go with it. 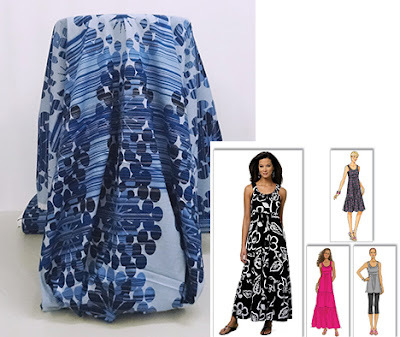 With such a large print, I had to really think about how to lay it out, and the print had a little star in one section that I decided to place in the front and center of the bodice. Then I tried to align the tiers so that the starburst floral would go right down the center front with all of the tiers. I love this dress. It is so cool to wear on a hot day. I absolutely couldn’t be happier with it! I actually didn't have quite enough fabric to make the bottom tier as intended- mine is half the width of the pattern and I think the length is perfect. Here's a close-up of the neckline with the gathered band. The second fabric was a blue, lavender and green cotton voile. It has a woven in stripe when you see it up close, and I wanted something as simple as possible for it. 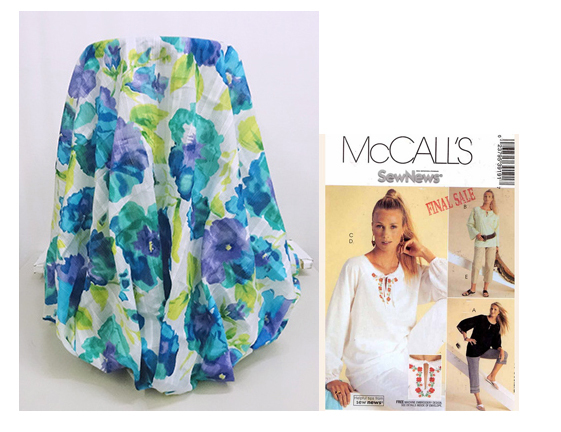 I found an older pattern, McCalls 3919, at a thrift store, and it was just what I had in mind. It is just a raglan sleeved peasant top with a front tie. The fabric was so lightweight that I used a little trick to make sure that the bottom of the shirt stayed down. 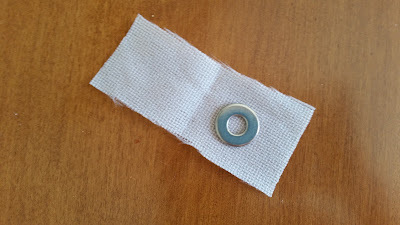 I encased some 5/8" wide washers in fusible interfacing, and then sewed them in the hem at strategic places. I used 5 of these little covered washers, hiding them behind some of the darker flowers so that they aren't visible. This fabric was really delicate and turning the ties turned out to be my biggest challenge, as I kept breaking through the fabric with my safety pin. I had been given a tube turner from someone a long time ago and never tried it out, but decided that this was the time. It worked like a charm on turning these delicate tubes. 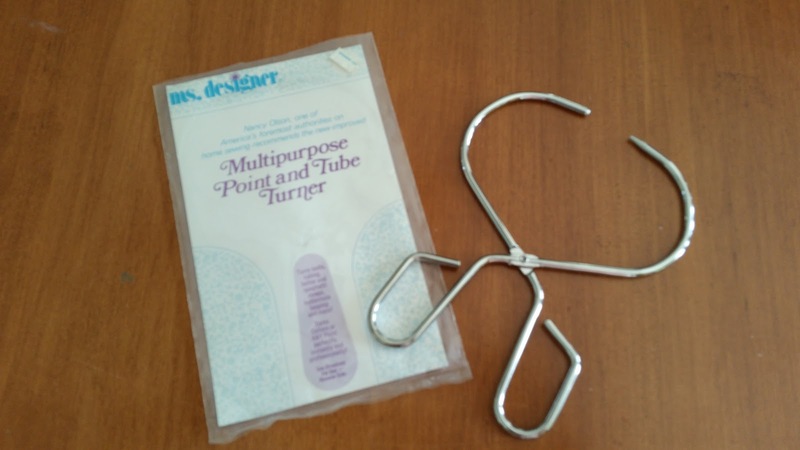 Here is what it looks like-kind of like tongs with the ends straightened out. If you can find one, I highly recommend it! 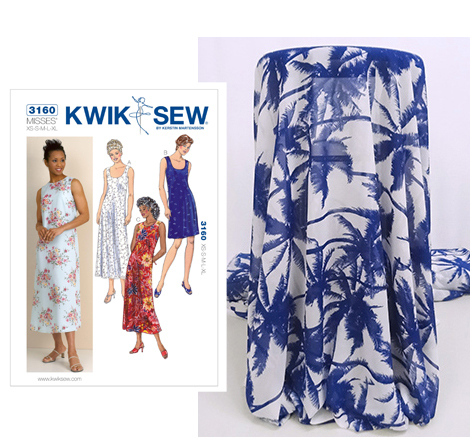 The third fabric was a blue and white chiffon print with palm trees. This one is still available in the 50% off section! I knew it would need to be lined, and wanted something really simple that would let the large print speak. I used Kwik Sew 3160 for this- just a front and back piece, completely lined, no zipper. This pattern is still available, and is really a great one to have for any sheer fabric. You could wear it belted, but on a hot day, I prefer nothing constricting. I lined it with a white cotton batiste. Laying it out before cutting, I used the cross-wise grain so that the top of the trees would be right side up. I cut the chiffon at the same time as the batiste by laying the chiffon on top of the batiste and then using a rotary cutter. The batiste worked as a stabilizer, plus it reduced the time spent cutting by doing them at the same time. Another time saver I used was sewing the neckline and armholes with the serger. With a serger, you don't need to go back and trim the seam. Especially when working with a fast-fraying fabric like chiffon, I like having the edge double stitched and finished so that it won't ravel. Because this dress is relatively straight, it didn't take much fabric. I had quite a bit of fabric leftover, so I decided to make a BONUS top! I love when that happens! 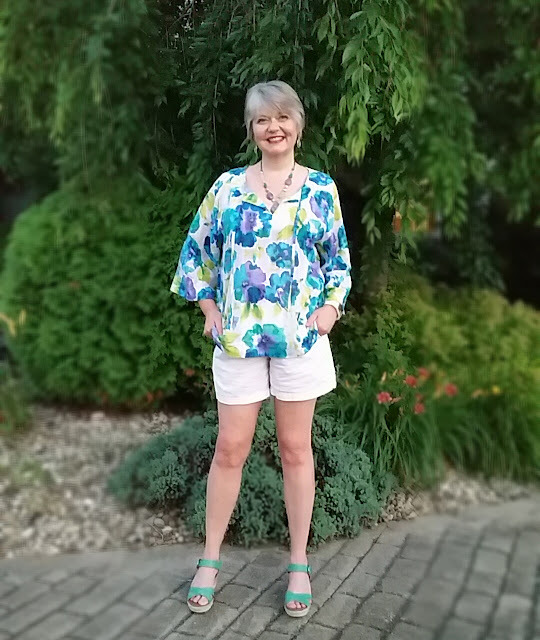 I had made McCalls 6204 before, and knew it worked well with chiffon, so I pulled out that pattern and luckily, I had just enough to squeeze out the top. It needs to be worn with a cami underneath. So, thanks to Fabric Mart and Maggy London, I'm all set for whatever summer heat may come our way! And you might have noticed, I got my hair all chopped off too! It really feels good. 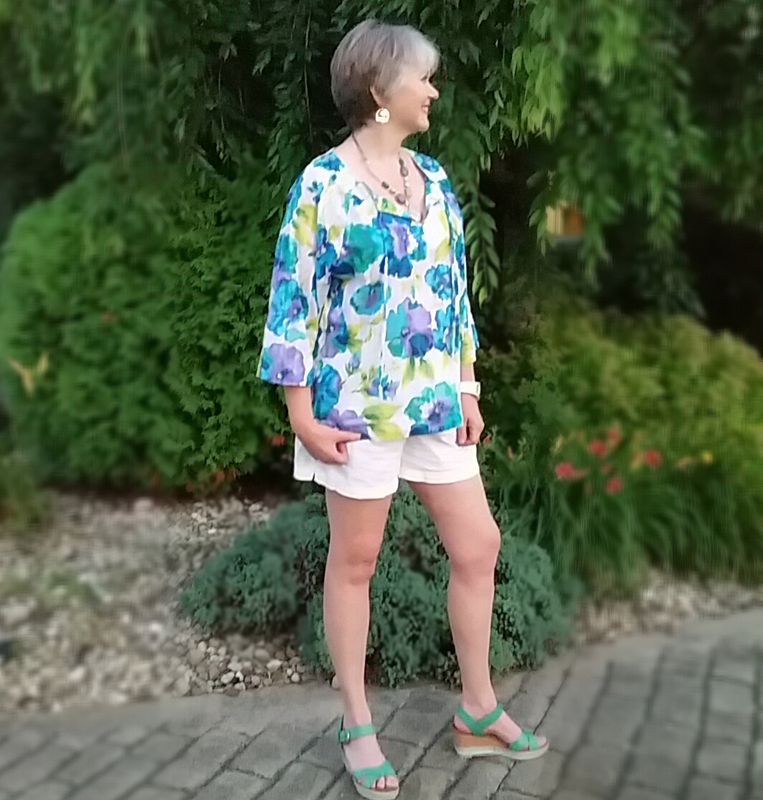 What do you sew to stay cool for summer? Ann, I love all your new pieces! That Maggy London fabric is always a treat to sew with! Great work! How lovely! I like them all. Oh, and your new short haircut is so cute!! Enjoy your summer in your lovely new clothes. All three garments are beautiful and would be perfect for me. Did you have to line the voile top? I never sewed with voile and have heard that it's quite sheer. If you lined it, what did you use? Thanks. Thanks, Jeanette. No, I did not line this one, however, if you were to make a skirt or dress, I would definitely line it. Your new pieces are gorgeous. 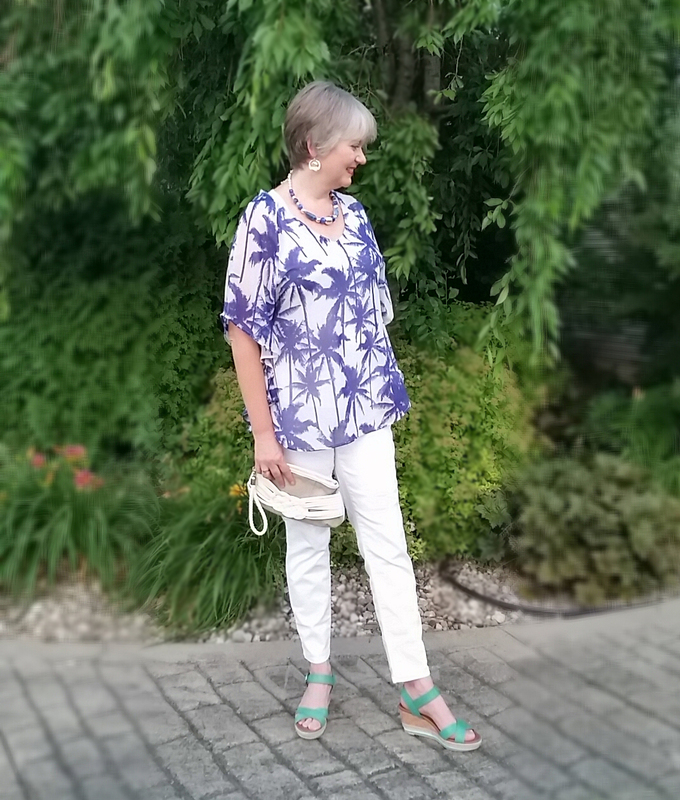 I'm really loving blue and white this season too! Great job Ann and what a wonderful showcase of the Maggy London fabrics! Thanks, Carolyn. I really love that Fabric Mart is carrying this designer's line. Ann, they're ALL SO Beautiful!! Very nicely done! WOW! All are fantastic!!! I wish I would have snatched up some of that poplin. And I love your haircut! Lovely outfits! They are so fresh and cool looking, well done. Your posts are always super cute and we can always count on multiples! 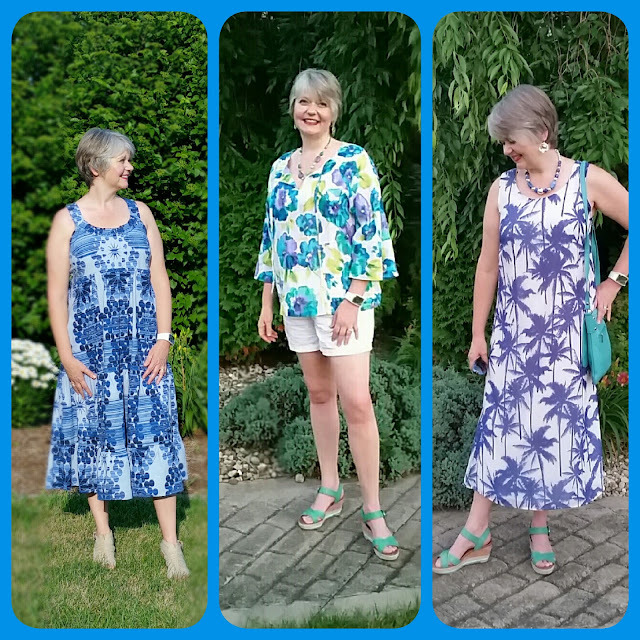 All are nice summer looks and I have the last two patterns in my stash as well as the palm tree fabric, nice to see them made up. Kudos! Aww thanks, Michelle! 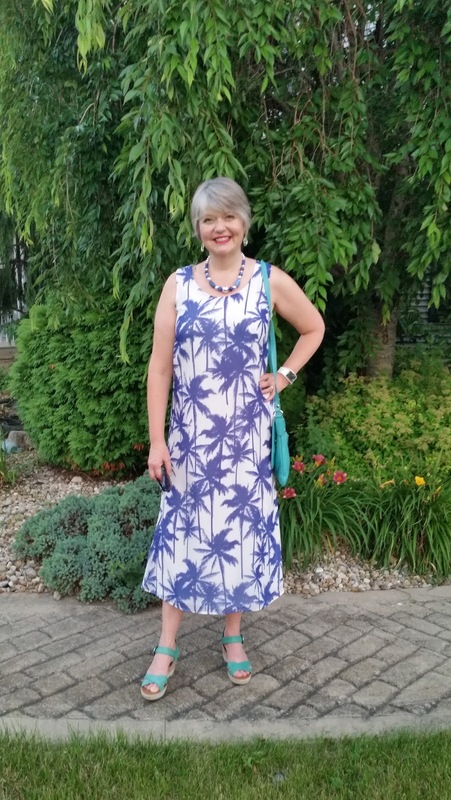 Would love to see what you are doing with the palm tree print! Thanks, Dina! I've heard that college students are now dying their hair grey, so I would fit right in! Haha! All your garments are lovely and I like the blue/white theme! What a great summer wardrobe! Very nice....Are you going on a cruise? The looks are perfect for a cruise vacation too. Thanks, Patricia. No, I'm not, but thanks for the idea! I'll run it by my husband!